One question we get all the time is “Can quality leads be generated from online channels”. You can read our previous post to get more details, but the answer is a simple ‘yes’. The fact is, we have found that, on average, online leads tend to be some of the lowest cost and highest ROI leads for our clients. So, if digital marketing can drive low-cost, high ROI leads, does that mean we should all move our advertising budget 100% to online? Our answer to that (which may surprise you) is: No! As a marketing agency that specializes in helping hearing aid clinics grow, we would never recommend dropping an entire strategy just because another one is working better. As the old saying goes: “If you can pay a nickel to gain a quarter, then you should keep on doing it”. The fact is, we are still seeing our clients achieve good, positive returns on their traditional marketing campaigns. Search Engine Optimization (SEO). For hearing clinics, SEO can be very effective and drive a lot of great quality leads. Remember, this strategy does take time, so the sooner you start the better off you will be. Pay-Per-Click Ads (Google & Bing). We love pairing a quality SEO campaign with a PPC campaign, because a good PPC campaign can start to bring in leads as soon as we turn the ads on. While PPC campaigns do take some time to optimize, we can still be very effective out of the gate with this strategy. Social Media Ads. Social media is a little different than PPC and SEO, as you are generally ‘pushing’ your message and services out to the person vs simply ‘pulling’ them in as they search for you. While we recommend implementing all three of the above strategies, today let’s take a deeper look into SEO for hearing clinics (we’ll go further into details on the other 2 strategies later). 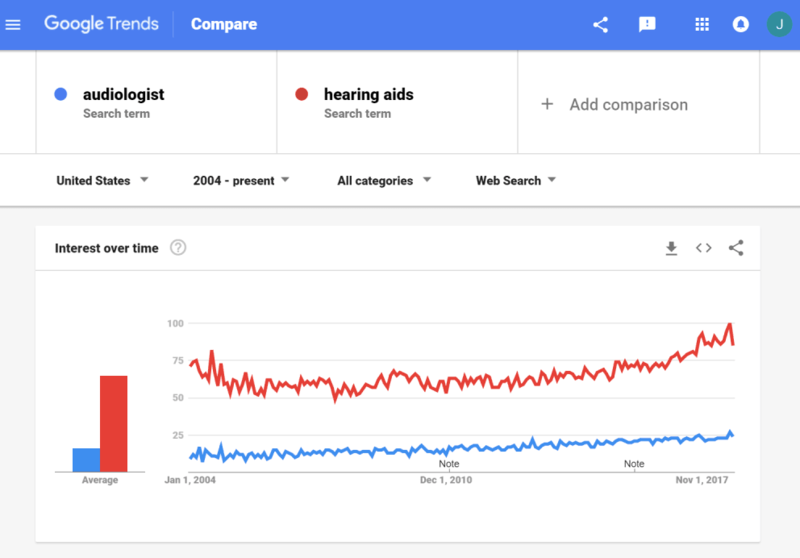 From the graphs above, you can see that the trend for people searching for ‘hearing aids’ and ‘audiologist’ has steadily risen in the past 7 years – and this is not a trend we expect to see decrease anytime soon. Technical SEO (title tags, header tags, content, page load speed, etc.). Is your website designed and developed following best SEO practices? You would be shocked at how many websites we see that are not set up properly for Google. They may look pretty, but Google is mainly looking at your code. N.A.P (Name, Address, Phone Number) Consistency. Your business listings need to be correct across all the various website directories. Website directories includes websites like Yelp!, Facebook, Google My Business, HealthGrades, Foursquare, Bing, etc. Reviews, Reviews, Reviews! I list reviews 3 times because they are that important. Not only are reviews a very large ranking factor, but they are a large conversion factor. In other words, even if you don’t rank #1 you can still get people calling you by having more & better reviews on sites such as Google, Facebook, HealthGrades, etc. Quality, Targeted, Educational Content. There is a saying in the SEO industry that “Content is King”. This may sound cliché, but it is 100% true. If you are an audiologist who provides services to people suffering from tinnitus you need to have information on your website that educates people on what tinnitus is and how you treat it. If you don’t have this information, then when someone searches something like ‘tinnitus treatment near me’, your website will not show up. Relevant Links Pointing To Your Website. “Link building’ may be one of the least understood aspects of SEO for hearing clinics, and it is also one of the most difficult to do properly. However, the fact is that Google uses the amount and quality of links pointing to your website as a very strong ranking factor. Just remember, these links need to be relevant to your industry and done in a way that is natural and drives potential customers to your website. This is the reason we don’t say we do ‘link building’, rather we say we earn links to your website. Putting all the above techniques into your SEO strategy is where the ‘Google magic’ starts to happen – over time more and more people start finding your website when they are searching for the services and products you offer. And because those people found you organically through search they start off with a certain level of trust. If Google trusts you enough to rank you high in it’s search algorithm, then it’s easier to help your future patients begin to trust you as well. However, keep in mind that an effective SEO strategy takes time, and there are a lot of variables that go into how fast we can help your hearing clinic rank in the top 3 positions of Google. However, when executed properly, SEO can continually bring in qualified, low-cost leads to your hearing practice for years to come. If you’re interested in a free report of your current Search Engine Optimization efforts on the website of your practice, just give us a call or shoot us an email and we would be happy to review that for you.